The KRISS Vector submachine gun arrived on the scene in 2007 to rave reviews. In 2015, KRISS released Gen II to similar praise. 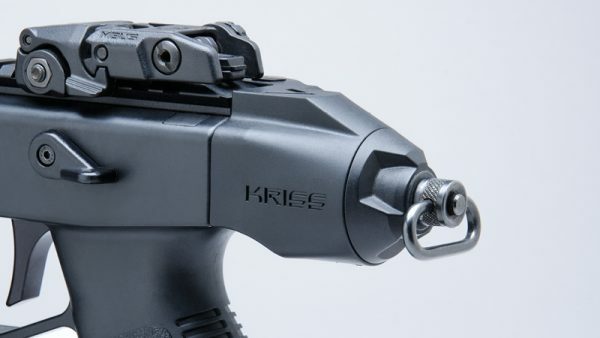 Of course, civilians didn’t want to be left out, so KRISS also released three configurations of a semi-automatic, civilian legal version, once again to a stellar reception. You might recognize the KRISS Vector submachine gun as the weapon of choice for various thugs and henchmen in The Purge: Anarchy, Taken 3, and Maze Runner: The Scorch Trials. Eagle-eyed viewers may have also noticed it in the Tailor’s arsenal in the John Wick sequel. Gamers may have spotted it in games like Pay Day 2 (under the name Kross Vertex), Far Cry 4, and Rainbow Six: Siege’s Operation Velvet Shell expansion (called the Vector .45 ACP in the latter two games). In real life, the KRISS Vector submachine gun is used by various military and police units around the world. These include military and law enforcement in the United States, the Indonesian Army, the Royal Thai Army and Royal Thai Police, and the Special Action Force of the Philippine National Police. Of course, what makes an exceptional gun exceptional is the design, and the KRISS Vector is no different. 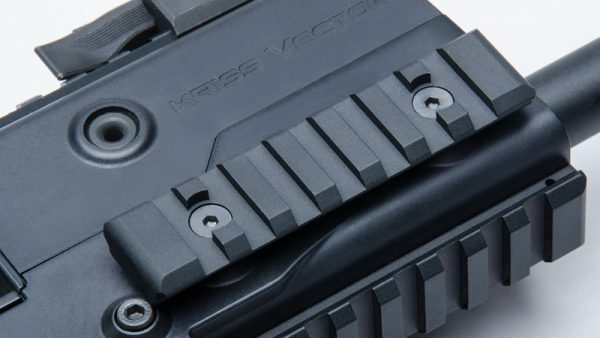 The hallmark of the Vector’s design is the KRISS Super V Recoil Mitigation System. 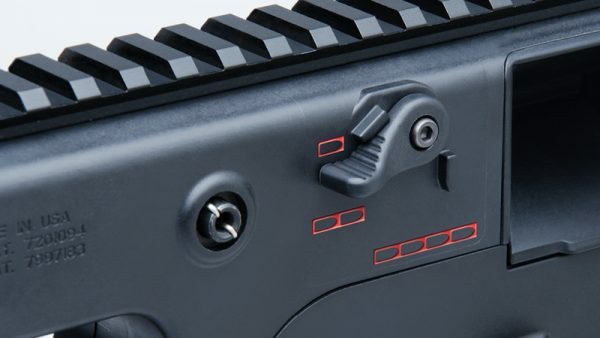 The system works by moving the bolt backward and camming an inertia block down behind the magazine well to direct energy down rather than back towards the shooter. This reduces the backward motion of the Vector, and therefore also reduces the shooter’s felt recoil and muzzle climb. 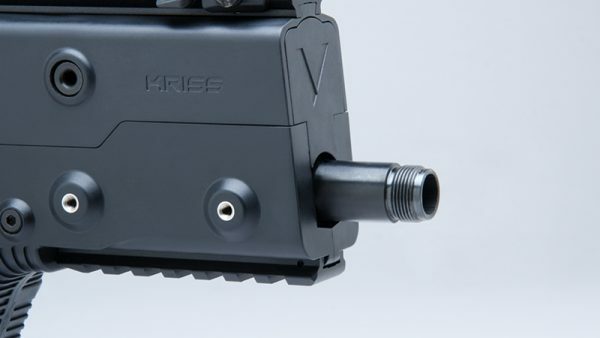 The KRISS Super V Recoil Mitigation System also features an unusually low bore axis to keep the barrel in line with the shooter’s hand, shoulder, and arm, further reducing muzzle climb. These features combine together to make the KRISS Vector easy to control, letting the shooter recover quicker and shoot off consecutive shots more quickly. In fact, the original prototype of the Vector was capable of shooting 1,500 rounds per minute, though production models are capable of a slower, but still quite impressive, 1,200 rounds per minute. Much like an AR-15 rifle, the KRISS Vector has two major assemblies, an upper and lower, but the makeup of the two assemblies is not quite what someone used to an AR-15 might expect due to the unique structure of the Vector. The Vector’s upper assembly is comprised of the ejection port, pistol grip, rail system, fire control components, and, for configurations that have one, the stock. While the Vector’s lower assembly consists of the barrel, charging handle, action, and magazine well. The assemblies can be separated without the use of any tools to allow for another one of the KRISS Vector’s awesome features: caliber conversion. Changing the Vector’s caliber is incredibly simple, requiring just the switching out of the lower receiver. The KRISS Vector features an ambidextrous safety, but the ejection port, charging handle, magazine release, and bolt release catch are all only available configured for right-handed use. Sorry lefties! 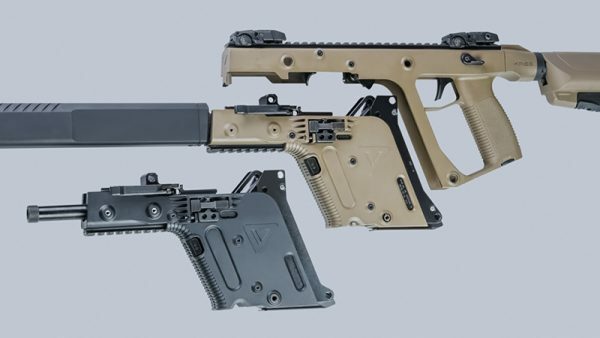 All three civilian versions and their corresponding lower receivers are available in five colors: Flat Black, Olive Drab (green), Flat Dark Earth (tan), Alpine (white), and Combat Gray. When the second generation of the KRISS Vector was introduced in 2015, it introduced a newly redesigned trigger and pistol grip, as well as a new design for the safety selector with the swing angle reduced from 120 degrees to 45 degrees. Since the Surefire weapon light, an optional add-on for Gen I versions of the Vector, stopped being manufactured before Gen II was designed, Gen II also no longer has a slot above the barrel where the light could attach. The original Gen I KRISS Vector submachine gun was chambered for .45 ACP, but with Gen II KRISS also introduced a 9 mm version. 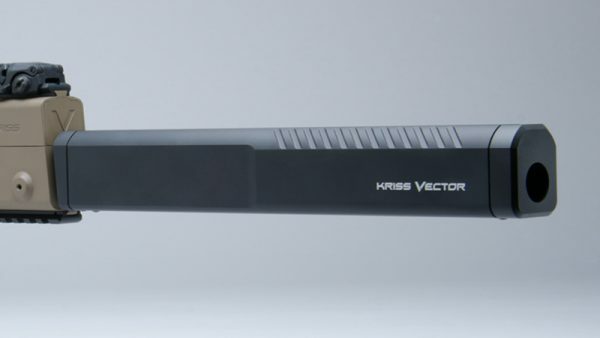 These are still the only two calibers used for the military and law enforcement version of the gun, the Vector SMG, but KRISS offers an expanded range of calibers for the civilian configurations. The civilian carbine (the Vector CRB), civilian short barrel rifle (the Vector SBR), and civilian special duty pistol (the Vector SDP) are all available in 9×19 mm Parabellum, 9×21 mm IMI (in the Italian market), .45 ACP, 10 mm, .40 S&W, and .357 SIG caliber versions. KRISS also discussed the possibility of a .22 long rifle version at SHOT Show 2015, but it has yet to come to fruition. Again, any of the civilian configurations of the Vector can shoot any of these calibers as long as you have the corresponding lower. Of course, each of these lowers will set you back about a grand, but that’s far cheaper than buying a whole new rifle and assuming you own a Glock of the same caliber, you can at least save on magazines. 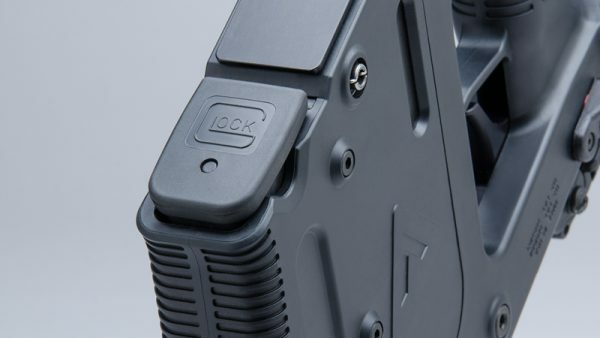 That’s right, the KRISS Vector is compatible with standard Glock magazines, which many (if not most) of you readers probably already have on hand and which have a reputation for reliability and ubiquity to rival the Vector’s. 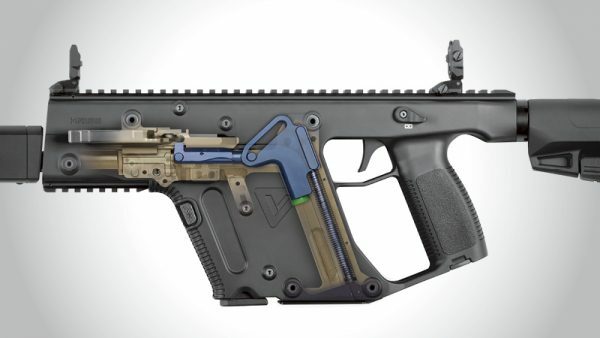 In addition to the standard capacity for their magazine, each civilian legal version of the KRISS Vector is also available for purchase with 10 round capacity magazines for those living in areas with magazine capacity restrictions. Now that we’ve talked about features you can expect to see across the Vector family of firearms, let’s talk about a few features of each specific configuration. The KRISS Vector Gen II SMG is the original submachine gun version of the KRISS Vector and is, therefore, only legal for law enforcement and military. But it’s an awesome gun whether the average person can buy it or not, so let’s take a look. The Vector Gen II SMG has, as you would expect, selective fire capabilities, allowing shooters to choose between, fully automatic fire, semi-automatic fire, and two round burst. There’s also plenty of room for accessories on the Vector Gen II SMG, with a standardized 13 inch 1913 Picatinny top rail, plus an additional six slot rail under the muzzle, and places to attach two more seven slot rails on either side. The Vector Gen II SMG has a 5.5-inch barrel and folding stock. The overall length of the Vector Gen II SMG is 24 inches with the stock extended and 16.75 inches with the stock folded. The KRISS Vector Gen II CRB is the semi-automatic carbine version of the KRISS Vector and is available in models with features that allow it to meet the requirements of most states’ rifle regulations without the need for extra taxes or permits. Compared to the Vector Gen II SMG, the Gen II CRB has an extended, 16-inch barrel in the KRISS Vector Enhanced Barrel Shroud in order to comply with short barrel rifle laws, bringing the total length of the gun to 35.25 inches. Like the Gen II SMG, the Gen II CRB has a standard folding stock, but is also available in models with a fixed stock to comply with states with folding stock bans. 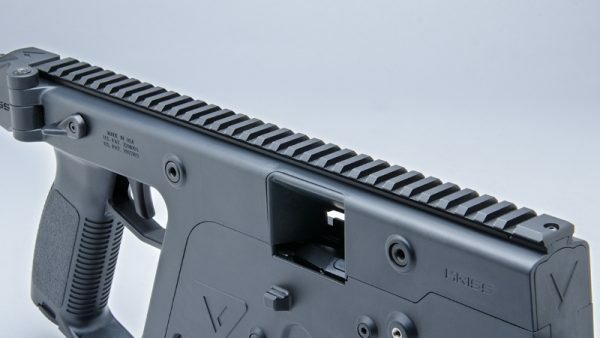 Also like the Gen II SMG, the Gen II CRB has a 13 inch Picatinny top rail, the six slot rail under the muzzle, and places to attach two more seven slot rails on either side. The KRISS Vector Gen II SBR, or short barrel rifle, is virtually the same gun as the KRISS Vector Gen II SMG, but with only semi-automatic firing capabilities. The Vector Gen II SBR has a 5.5-inch barrel and folding stock, like the Vector Gen II SMG, and also has the same overall length (24 inches with the stock extended and 16.75 inches with the stock folded). The Vector Gen II SBR also has the same Picatinny rail setup up as the Vector Gen II SMG and Vector Gen II CRB. Additionally, the Vector Gen II SBR has a standard threaded muzzle to allow shooters to attach their preferred suppressor or other muzzle devices. Last up is the KRISS Vector Gen II SDP, a pistol configuration of the KRISS Vector. Like the SBR and SMG, the SDP has a threaded muzzle. The SDP also has the same Picatinny rail setup around the muzzle as the other Vector firearms, though it does not have the top rail. The Vector Gen II SDP also lacks the folding stock seen on the rifle configurations, replacing it instead with a detachable sling point. It can be purchased with an additional arm brace produced by SB Tactical, which can also be purchased separately. The KRISS Vector is one of the most popular subguns in the world and with good reason. It has served with distinction in some of the more difficult combat areas and is a favorite in first-person shooter games. Its .45 ACP chambering gives it substantially power while still remaining easy to shoot, and its small form factor makes it ideal for tight environments. Looking to feed your Vector? Take a look at our recommendations for .45 ACP and 9mm ammo! What do you think of the KRISS Vector? Thinking about picking up one of the civilian versions? Let us know in the comments below! I have the 45 ACP pistol version for ease of locating ammo, but I’d really like to have a 10mm conversation kit as well. Shame they’re so expensive. It makes more sense just to buy another in 10mm. Also, the action is rather stiff. Is that typical or will it loosen up after some use? I like the 45. More hitting power, but 9mm is cheaper to shoot with less recoil, although recoil isn’t a negative factor for any center-fire caliber in this firearm. If you have any thoughts of getting a supressor in the future, go with the 45. The 200-230gr 45 ACP can be loaded quite hot and still be subsonic. I wonder if you wrote this cause your last name is kriss lol jk, but my last name is kriss and I’ve never met another kriss besides my mom and brother, get at me. Love the Vector, never thought I would want to buy one. Best part are those powerful calibers. Wicked.